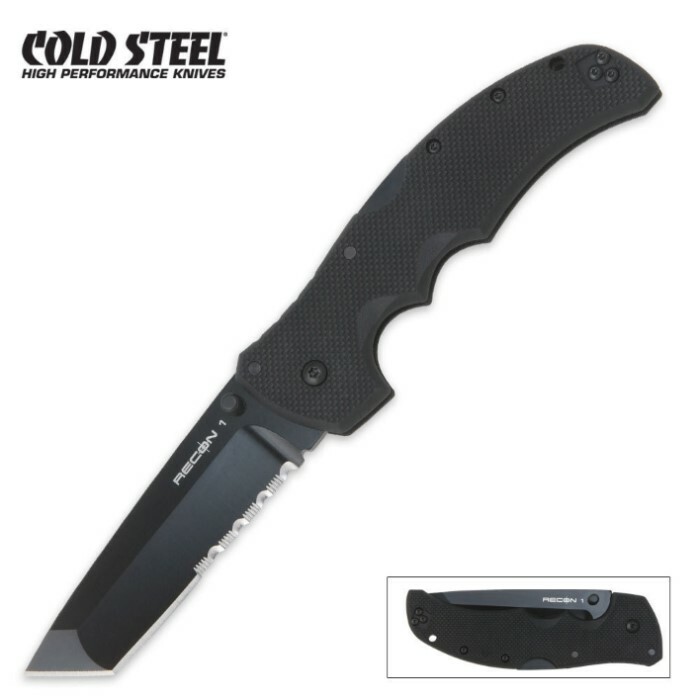 Cold Steel Recon 1 Tanto Part Serrated Folding Knife | BUDK.com - Knives & Swords At The Lowest Prices! This is an unbelievable knife. By far the sharpest blade i have ever owned. I use it as my edc and just having it by your side makes you feel safe in this crazy world we live in. Worth every penny. I've had this knife for about a year now and it has just lost its razor edge. by far the sturdiest folding knife I've owned. anyone who is looking for a reliable knife this is it! First of all, in the description it says that this knife has the Cold Steel ultra lock, but its actually the triad lock. That's fine because the triad lock is actually stronger. The knife is amazing. I've had mine for about a month now and have used it every day since I got it and it is still razor sharp. The black Teflon coating on the blade has started to come off but that's common. All around it is an amazing knife. I would defiantly suggest that anyone reading this review buy it!!!! This is the best knife for under a $100 bucks that I have found. Razor sharp sturdy blade, secure locking. Simply awesome grip, shape, and couture. If you want a great knife that wont break the bank check it out. This knife is nothing but the best on the market. The blade is razor sharp with one of the best serrated edges I have ever seen. the grip on this knife is amazing when you are holding it it feels as if it could not be dropped. this is because of the G-10 handle they have engineered. the only draw back is the clip could be a little longer then it is, it is about an inch and a half. It comes with two clips so if you are a lefty all you have to do is unscrew the clip and put the lefty one on. so in conclusion one of the best if not the best folding knives i have. A MUST HAVE!